Well, I didn’t expect to disappear for the entire week of my vacation but it was busy and while I missed blogging I also enjoyed having a bit of a break. Besides removing the ugly molded plastic shower wall and replacing it with ceramic tile, I spent time reading –though not as much as I expected — and gardening — as much as I had hoped but not as much as I would have liked. A few weeks ago a job announcement got blasted out through the Minnesota library mailing lists about two librarian positions open at the University of North Dakota. You know a place has trouble filling positions when they say things like, sure it’s cold here but the winter sports are great. Or when they tell you they have a low cost of living and are only 45 minutes from the “big” city of Fargo (population 113,000 — Minneapolis population is close to 400,000). I briefly considered, thinking I could afford to buy a couple acres and wow, think of the gardening I could do then! I told Bookman about it and how we could buy acres and he shook his head and said, no way, that’s too much digging. Poor Bookman, I guess I’ve been asking him do do a lot of digging lately. On the bright side though all that digging is paying off. We celebrated Summer Solstice yesterday with a meal that came largely from the garden. We had salad with greens freshly picked. We had a sautee of garlic scapes from our garlic that also included green beans we had canned from last summer’s garden (beans are just now starting to flower so we don’t have any fresh yet), and a few leaves of sage. There was a bit of potato too that didn’t come from the garden but in a year or two we will give potato growing a try. Bookman made bread from scratch and I had apple butter on my bread made from our own apples last fall. And for dessert we had strawberries from the garden. It was all so filling and ever so very delicious. varieties produce them. Since hardneck garlic is the only reliably cold hardy kind for my area we conveniently had some. I didn’t know about cooking them until I was checking online recently to find out when to harvest my garlic. It was then I also learned about the scapes. You can do all kinds of things with them. They have a very mild garlic flavor. You can use them like you would green onions or roast them like you would asparagus or sautee them like we did. We sadly ate all of them last night and I find myself looking forward to this time next year so I can have more. Very soon we will be able to start picking peas. 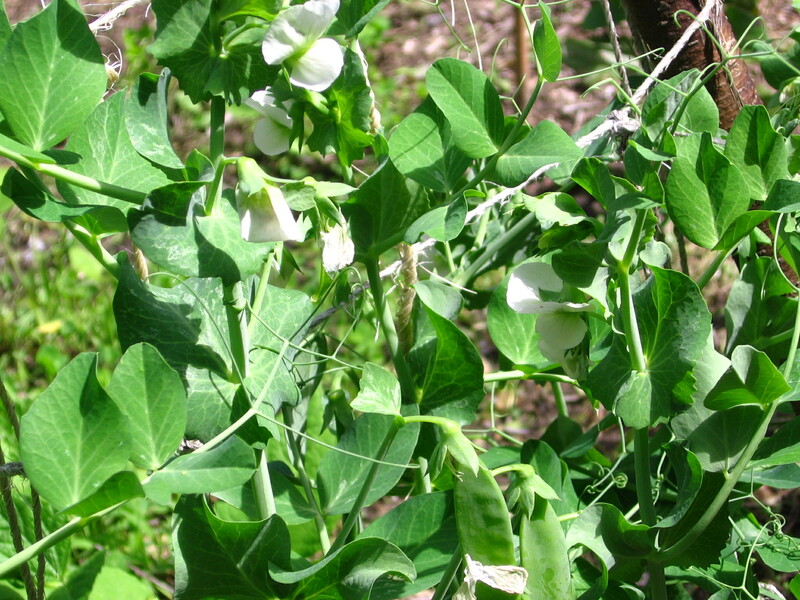 They began flowering early last week and there are big pods already but the peas haven’t fattened up yet. I love fresh peas. I can hardly wait! I planted a lot of peas this year, more than I did last year. And already I am wishing I planted more because, can a person have too many peas? Next spring I am planting the whole gosh darn seed packet! but this year I have to admit I am glad. I know a few people with clay soil in their gardens and they are having a rough time of it because all their plants are waterlogged. All the rain has encouraged an explosion of mushrooms all over the garden. 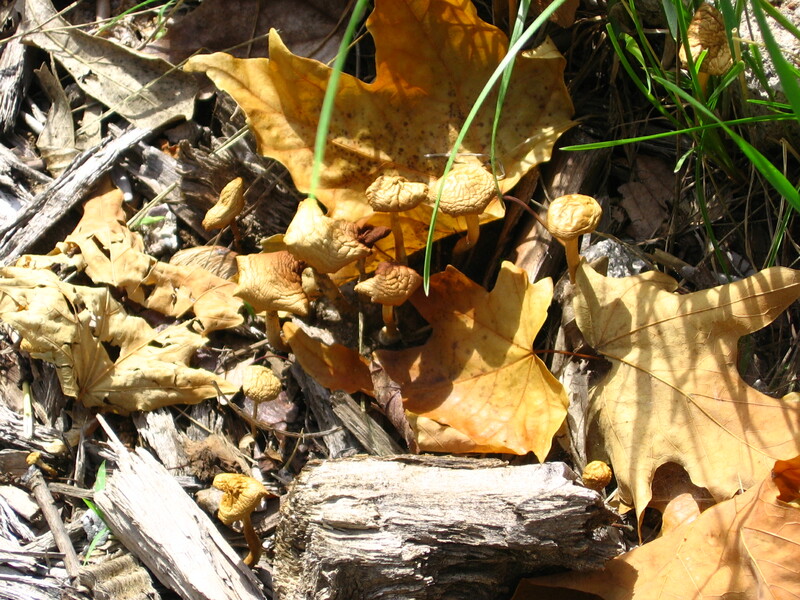 I don’t know what kind they are but there are a number of different ones, some big white and puffy, others small and brown or tiny delicate and white, and others tan and flat. Remember a few weeks ago I mentioned all the milkweed that had popped up in my garden? Well last week I noticed something was chewing the leaves on one of them. I carefully moved leaves around looking for what it might be. Can you guess what I found? Not one but two monarch butterfly caterpillars! I can’t even begin to say how thrilled I was. I might even have gotten a little teary eyed. Along with the caterpillars I saw a red admiral butterfly sunning itself on a rock in the garden. The dragonflies are still hunting in the garden. They are huge this year and there are plenty of mosquitoes to eat. There are tiny baby crickets everywhere, various kinds of spiders, and busy ants. I also have pollinators hovering everywhere there is a flower. After just a week with plants, Amy Pond is beginning to clear up. The three goldfish are still hanging in there too. The watercress is getting past sprout stage and getting more leaves. It will be several weeks before we can eat any but it’s something to look forward to. One last thing in this wild ramble. This week I learned there is wisdom in planting regular garden rows at least when you have not grown something before and have no idea what it looks like. Case in point: parsnip. I love parsnip but when we buy it at the store it has its greens cut off. I planted parsnip in my polyculture bed and I have no idea what it looks like. Is that a weed or a parsnip? No idea. 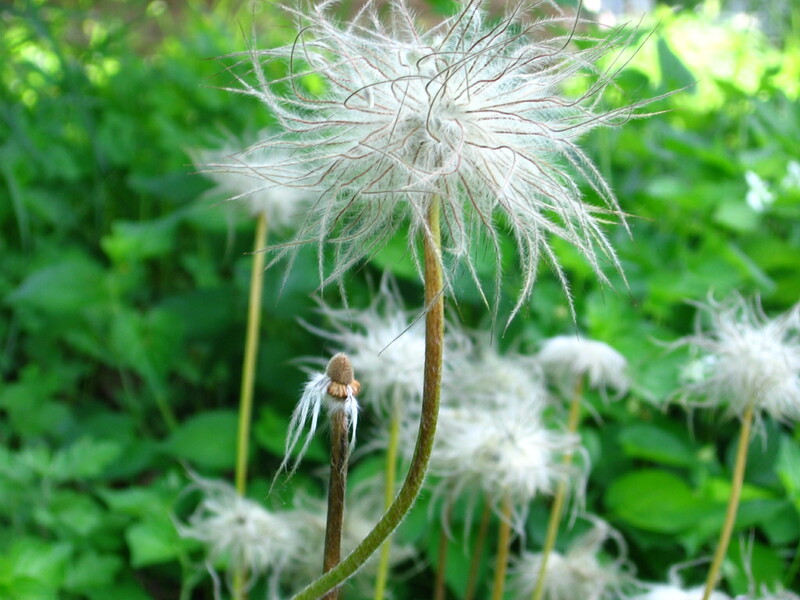 So unless I recognize it as a weed I am just leaving it alone. If it flowers, it is not a parsnip and I will pull it out right away. Parsnips are biennial, meaning they grow for two years and don’t flower until the second year (but you eat them after the first season). When we planted the polyculture bed we scattered the seeds all over, not in rows, so currently I suspect I am tending some weeds but I don’t know for sure. Another case in point: leeks. I know what leek greens look like when they are fully grown but not when they are sprouting. They also grow really slowly I have learned. I know I planted leek seeds near the beans but again, I didn’t exactly do it in one recognizable row. So I am weeding and grab something that looks like grass and pull it out and there is a mild oniony scent and I realize I have just pulled out a leek sprout. Oops. As I weed I keep coming across little bunches of spindly looking grass and I have to pause, is this grass or a leek? I’ve left the bunches for now and will have to keep an eye on them. Eventually it will become clear what is grass and what are leeks, but if I had thought about it in the spring and planted them in a marked row I wouldn’t be wondering now. Note to self: next time you grow something you have never grown before, make sure you plant it in such a way that will make it easily identifiable when is sprouts. Save the random interplanting for things you are familiar with. Tomorrow I head back to work and return to regularly scheduled programming. I’m really going to miss spending my early mornings in the garden. It certainly has been a wet spring here, too. And cool. I’m happy I got some real summer weather during our three days in Louisiana, because it hasn’t even been hot enough here yet to go swimming. Early mornings in the garden–even if it’s just stepping into a garden for a moment or two before going somewhere–can be the best thing about “summer” in the north (and I define “north” as anything north of St. Louis). I’m thrilled about the monarch butterfly news, too! Good for you! Melwyk, oh a scape pesto sounds delicious! Ah, I’ve been looking out for a post from you – but am glad you had a break. It’s good for the soul. Loved your post and it sounds like you had a very lovely week. As for parsnips, would they have soft feathery leaves like carrots? I’m wondering about the plant in the bottom left of the picture that looks different to all the broader leaves around it – but it also reminds me of something else. Anyhow, good luck with your weeding and plant identification. whisperinggums, yes, a break is good for the soul now and then. As for the garlic, I’ve not heard of anything else having scapes but that doesn’t mean anything! When you do identify them, you must show us! I did do a Google images search after writing my response and felt those weren’t it, but the images were quite varied – partly angle I think but partly perhaps age of plant. Good … We all look forward to it. Oh, and no, I’d never heard of garlic scapes before. Is it only garlic that has scapes? I love your Sunday gardening posts Stefanie. On Monday mornings I grab a cup of coffee and sit down, stiff and sore from weekend gardening. I read your posts and then get excited all over again about returning to the garden. I have heard of garlic scrapes before but have not tried them. I’m unsure if mine are a hardneck variety; must look into that. Your Summer Solstice celebration and meal sounded perfect. I’m not sure what parsnip tops look like. I think it’s better to host weeds for a little while until you’re sure what’s what. 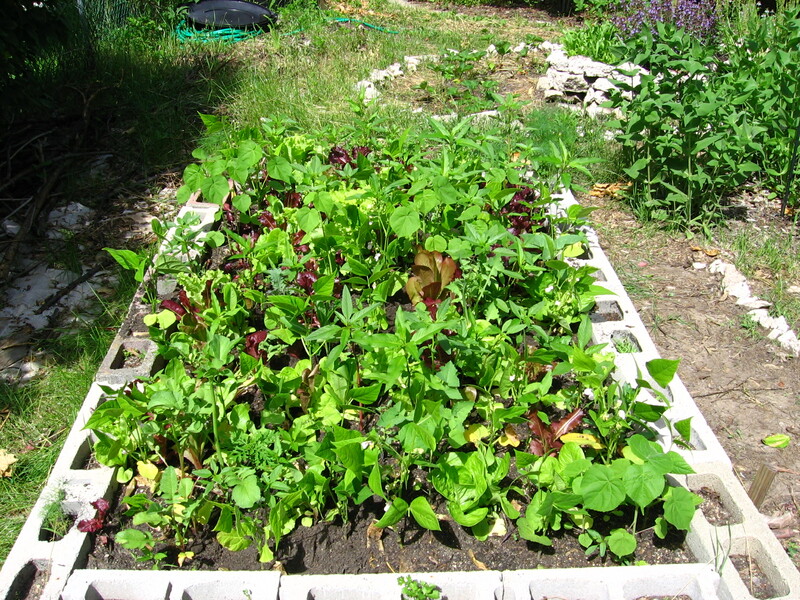 Your polyculture bed looks very nice. Ours did not turn out well this spring. The rains were too much for the beets, cilantro, and chard. One lone shallot made it and last night I did a happy dance around the outside of the bed. Hooray for the caterpillars! That’s very happy news indeed. Thanks for sharing your notes from your vacation and I hope your return to the normal schedule goes smoothly. Vanessa, oh I am so glad you enjoy them! When I write them I am tired out but by the end I am excited again and thinking that maybe I could get a little more time in before sunset. 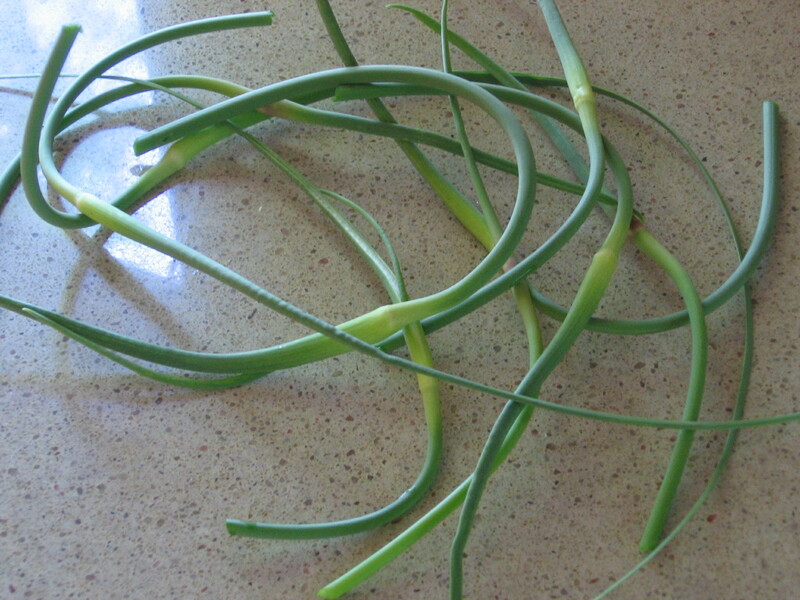 If your garlic is hardneck, try the scapes for sure. If not, perhaps try growing some next year. So tasty! Last year I found two caterpillars on my parsley plants. I was so excited I took pictures of them. Every few days I’d go out to check on their progress until one day…they were both gone. I’m not sure but I think they turned into a red cardinal before they got the chance to turn into butterflies. The same thing happened to a much loved Argiope aurantia in his lovely zig-zagged web. As I was leaving for work, I found a cardinal acting very suspiciously…hanging around the web..too close. I tried to shoo him away, but finally had to tell Flash (that’s what I named my spider friend) that I couldn’t take a day off just to guard his web and he’d have to be on his own. When I got home that evening I found the web had been destroyed and Flash was gone (and probably a “goner). Nature – it’s cruel and beautiful. Grad, wow, that Flash, he was busy! I haven’t seen my caterpillars for a few days and I fear the worst. They weren’t big enough to be making a cocoon yet. I’m hoping they moved house to a different milkweed plant. I love when those big garden spiders show up. They are so fascinating to watch! And their webs are gorgeous. You are right, nature is cruel but beautiful. Having a garden is quite educational! How cool (and fitting) that you were able to make your Solstice meal almost entirely from the plants in your garden–it sounds like it was yummy. I would have gobbled that garlic up, too! Isn’t it pleasant being out there and noticing all the small things that most people overlook? It may seem so quiet and as though you are all alone, but boy, you have quite the buzzing ecosystem thriving! I never manage to do all the things I want to–and breaks are never long enough, but it sounds like you accomplished lots! Hopefully you are still going to continue your weekly afternoons off? Danielle, heh, it sure is! Two weeks ago I was hoping we’d be able to make a large part of our Solstice meal from the garden but wasn’t so sure but things moved along faster than I expected. It is so fun bending down and seeing so many interesting things. The crickets are so tiny right now, just hatched. And I saw a tiny grasshopper too. Somehow it was cute while I wouldn’t be too pleased with its adult self. Breaks are never long enough, you are right. Yes, I’ll still be taking Friday afternoons off. I’m so happy I can do that! The condition of the jobs market makes it surprising that they have to work so hard to sell those posts. You’d have thought people would be busting to get to the head of the queue.